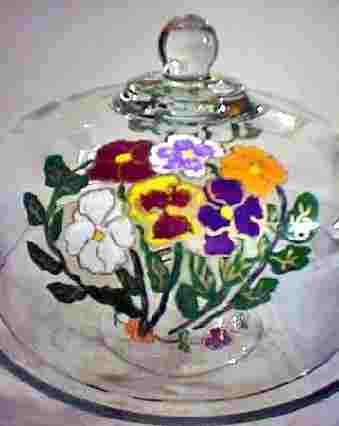 Cake Plate With Dome in beautiful fall colored pansies is one of our top selling cake plates due to the multicolored hand painted blooms rich with reds, purples, oranges, whites and the large green leaves in various shades of green. 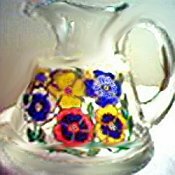 The pansy is a sturdy flower in cold weather which is hard to believe due to their delicate looking blooms. We couldn't image that this fragile looking flower could be so strong. That is why we hand paint the colors in deep rich colors to match their personality. Our cake plate with dome measures between 12 to 13 in diameter depending on the style you choose. Clearly Susan loves to take custom orders. If you have another design in mind contact me and we will be delighted to hand paint whatever you like.